Compact 3-wheeled robotic mower for efficient mowing of more open grass areas. Suitable for smaller lawns up to 600 mý and can also handle slopes with an incline of 25%. It is easy to use and offers personal settings. Polar white colour is available as an option. Offer valid 01/09/17 – 31/12/17 while stocks last at participating authorised Husqvarna Servicing Dealers. Advanced 4-wheeled robotic mower for larger and more complex grass areas. Suitable for medium sized areas up to 1500 mý and can also handle slopes with an incline of 40%. Smart technology adapts the amount of mowing to the lawn?s growth rate, enables spot mowing of a limited area of longer grass and guides the mower through narrow passages. The intuitive menu system on the large, user-friendly display allows personal settings for when you’d like the machine to mow. Snap-covers in different colours are available as options. Large size robotic mower with generous in-built competence. 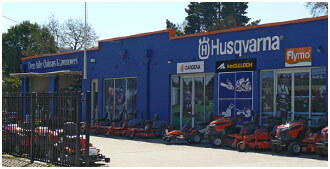 Equipped with GPS navigation for efficient mowing of the most various, demanding grass areas. Suitable for larger areas up to 3200 mý and can handle steep slopes with an incline of as much as 45%. Smart technology adapts the amount of mowing to the lawn?s growth rate, enables spot mowing of a limited area of longer grass and guides the mower through narrow passages. The intuitive menu on the large, user-friendly display allows personal settings for when you’d like the machine to mow. Polar white colour and headlights are available as options. Top of the range model from the world leaders in robotic mowing. Smart enough to negotiate the challenges of large and complex lawns ? like multiple narrow passages, obstacles, tough terrain and slopes up to 45%. GPS-assisted navigation and a host of features including Automower© Connect make it the intelligent way to keep your lawn green, healthy and perfectly mowed. The Automower© Connect app keeps you in control: track, interact and stay updated at the touch of a screen, wherever you are in the world.